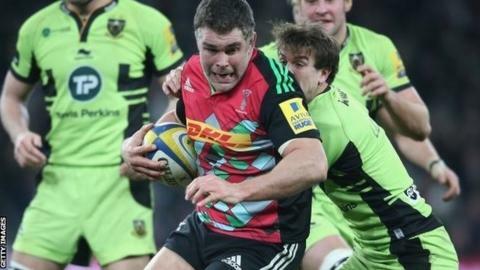 Harlequins number eight Nick Easter says he is "desperate" to play for England again and believes he deserves a second chance. England coach Stuart Lancaster needs to replace Ben Morgan, who was ruled out of the Six Nations - which starts next month - after fracturing his leg. Easter, 36, has 47 England caps but has not added to them since 2011, although he is enjoying good form for his club. "If you're looking for hunger then you need not look any further," he said. When asked if he could still do a job for England in a BBC Radio 5 live interview, Easter said: "Oh yeah, I know 100% I can and I'm desperate to as well. "I think I have more reason than any other, considering how the last World Cup went. It's been a driving force for me." Easter, who played for England between 2007 and 2011, was named man of the match in Saturday's 32-12 victory over Leicester and played a role in all four of Harlequins' tries. Earlier in the week, former England captain Lawrence Dallaglio backed Easter to get a recall to face Wales in England's first Six Nations match, on 6 February.